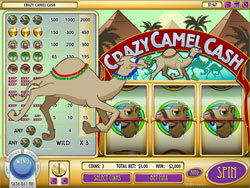 Crazy Camel Cash is a rival gaming slot which is very easy to play. The Crazy Camel symbol is wild and substitutes for all symbols. If 2 crazy camels land on the payline - your win will be tripled. Get 3 crazy camels in a row and win the jackpot!